RIVERSIDE, Iowa—The Fourth Annual Cobra/Puma Junior Cup Matches will take place June 2-3 at the Burlington Golf Club. This Ryder Cup format event features the Iowa PGA Junior Tour versus the Gateway Section (St. Louis Area). The Principal Charity Classic pre-qualifier was held on May 31 at the Tournament Club of Iowa. Click here for the results. The Principal Charity Classic qualifier will take place on Monday, June 4 at the Tournament Club of Iowa. Click here for more information. The Junior Tour will host the kickoff event for the 2018 season, Monday, June 4 at the Edmundson Golf Course and Harvest Point Golf Course. This is an Ace Point Event on the Iowa Junior Tour. Native Iowan, Iowa Golf Hall of Fame member, and Championships Tour Winner Jerry Smith will be on hand to start the junior tour members at the first tee. Jerry will be participating in this year's Principal Charity Classic at Wakonda. Special thanks to Head Golf Professional Matt Sherlock of Edmundson Golf Course and Head Golf Professional Jeff Smith of Harvest Point Golf Course for hosting this year's event. The Iowa PGA would also like to thank title sponsor The Principal Charity Classic for their continued support. 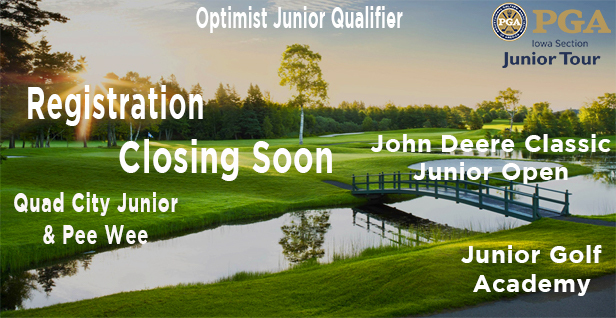 The John Deere Classic Junior Open will take place June 9-10 at TPC Deere Run. This will be a Major Point event on the Iowa Junior Tour. We would like to thank The John Deere Classic and Clair Peterson for their support as title sponsor. Special thanks to Head PGA Pro Ron Scheyd, PGA, and General Manager Todd Hajduk, and the entire staff at TPC Deere Run for their support in hosting this event. Drive, Chip, and Putt will host the first local qualifying event on June 10 at TPC Deere Run. Registration will be open until June 5. Click here for more information. Women’s Golf Day is a one-day event celebrating girls and women playing golf and learning the skills that last a lifetime. Women’s Golf Day is a four-hour experience happening globally where women and girls can experience golf for the first-time or where current players can play and engage with women interested in golf. Please pass this information along to anyone that may be interested in participating. Also, PGA Professionals are encouraged to help run this event, and sales reps are encouraged to help in any way that they can. Be sure to stay connected with the Iowa PGA on Facebook, Twitter, and Instagram for the latest news and tournament updates!